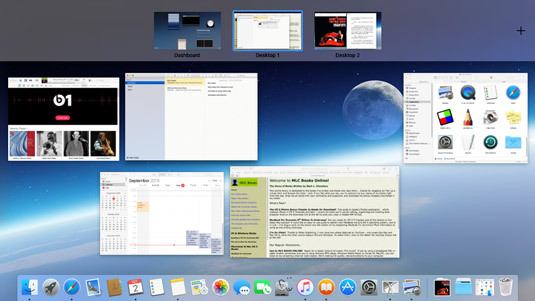 Press F3 (or Control+↑, depending on your keyboard) to show all open windows using Mission Control, grouped by application; then click the one you want. Move the pointer on top of the window you want to activate — the window turns blue when it’s selected — and click once to switch to that window. You can specify which keys you want to use in the Mission Control pane in System Preferences. Press Ctrl+F3 (or Control+↓, depending on your keyboard) to show all open windows from the application that you’re currently using; click the one you want to activate. This Mission Control function is great for choosing from all the images you’ve opened in Photoshop or all the Safari web pages populating your Desktop! Astute observers will notice that the application menu bar also changes to match the now-active application. Besides the F3 and Control+F3 hot keys, Mission Control provides one more nifty function: Press ⌘+F3, and all your open windows scurry to the side of the screen. Now you can work with drives, files, and aliases on your Desktop — and when you’re ready to confront those dozen application windows again, just press the keyboard shortcut a second time. Although the Mission Control screen appears automatically when necessary, you can launch it at any time from your MacBook’s Launchpad display or by pressing the Mission Control key on your keyboard. From the trackpad, display the Mission Control screen by swiping up with three fingers.